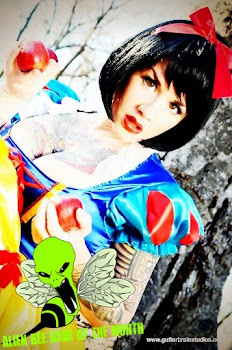 Alien Bee: SCARES THAT CARE "Psycho Social" Fundraiser On October 22 - Details Inside! SCARES THAT CARE "Psycho Social" Fundraiser On October 22 - Details Inside! 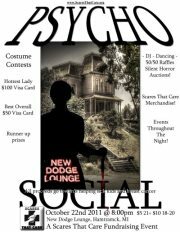 Our pals at SCARES THAT CARE are having a fundraiser tomorrow at the New Dodge Lounge 8850 Joseph Campau, Hamtramck, Mi. I'm always up for a good cause so all of you be sure to check this out and if you're close enough go and have a great time because it sounds like a lot of fun and you'll be helping some people out! Halloween is right around the corner so come dressed as your Favorite Psycho! Costume Contests? Yea, we got those! Ladies! Come dressed to impress! Hottest Dressed Up Lady will win a $100 Visa Gift Card! Best Overall Costume will win a $50 Visa Gift Card! Runner up Prizes will also be given! Silent Auction featuring some Amazing Horror related merchandise! Autographed Items, Signed Books, Zombie Goodies, and more! 50/50 Raffles, Scares Merchandise Table, Drinks, DJ, and lots more! DJ Tim Pop will be taking requests all night long! We will be giving away 5 tickets to the Flint Horror Con! Just in! Guess the Number of Candy Corns in a Jar and win a $60 gift certificate good towards any Tattoo at Artistic Superstition Tattoos and Piercings! $1 Per Guess! Come have a good time, donate some cash, and help some sick kids! Don't forget to bring a Designated Driver! And yes the Red Wings will be playing that night, versus the Washington Caps. Scares That Care is a 501(c)(3) charity dedicated to uniting horror fans to help sick kids, and women fighting Breast Cancer!